A capacity audience was delighted to be present for a fantastic night of music as Black Dyke Band (Musical Director Dr. Nicholas Childs) returned to Sheffield Citadel on Thursday, 22 October 2015. Visitors commented on the relaxed atmosphere of the concert and how much they enjoyed the quality playing by the band and its soloists. A number of Salvation Army pieces were included on the program, including the march Sheffield Citadel (Herbert Mountain). Sheffield Citadel Bandmaster Keith Wileman was invited to conduct Black Dyke Band in what is Sheffield Citadel Band’ signature march and the audience, and the band, responded enthusiastically. A more reflective moment came when the band played the hymn tune “Deep Harmony” in memory of Roy Shenton, a friend of both Black Dyke Band and Sheffield Citadel Band. 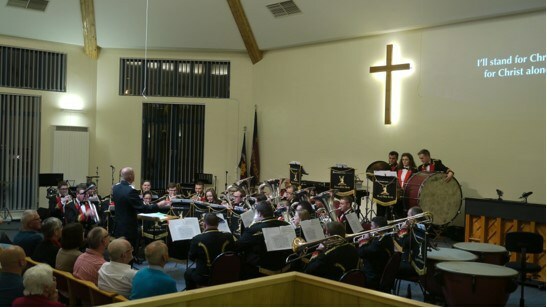 This article was posted in News and tagged Black Dyke Band, concert, Katrina Marzella, Keith Wileman, Nicholas Childs, Richard Marshall, Roger Harvey, Roy Shenton, Sheffield Citadel, Sheffield Citadel Band on 12 January 2016 .